have a soft spot for Alwinton and, like a homing pigeon, I keep returning. It is the last village in Coquetdale and nestles beneath the slopes of Lord`s Seat, Castle Hills and Gallow Law. It occupies a prime position at the south-east corner of the Northumberland National Park and is the ideal starting point for a vast array of walks into the Cheviot Hills. The village stands on the route of Clennell Street, the king of all the Cheviot drove roads. This delightful track was once a key route for taking Scottish cattle to English markets and crosses the border at Hexpethgate, some eight rollercoaster miles from Alwinton. These days Clennell Street makes a superb cross-country artery for walkers wishing to explore the delights of England`s most northerly hills. 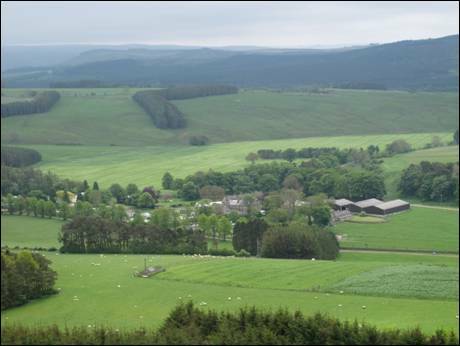 fter an absence of a handful of months and, with the promise of a fine day in store, I therefore needed no persuading to head back to Alwinton for a 5 mile walk over the small, grass-covered hills which lie to the north-east of the River Alwin. The sun was barely out of bed as I wandered past the tiny Rose & Thistle public house and crossed the Hosedon Burn, via a thread-thin wooden footbridge, to join Clennell Street heading north. A signpost pointed the way to a distant `Border Ridge`. The firm and gently rising track slowly eased my early morning legs into action and soon the views were beginning to open up. To the north-east, Clennell Hill and its close neighbour Silverton Hill vied for my attention whilst straight ahead Gallow Law flashed a tempting glance in my direction. One, I thought, for another day and left Clennell Street by clambering over a ladder stile to my right. I headed across two delightful and relatively flat grass-covered fields towards Clennell Hall. 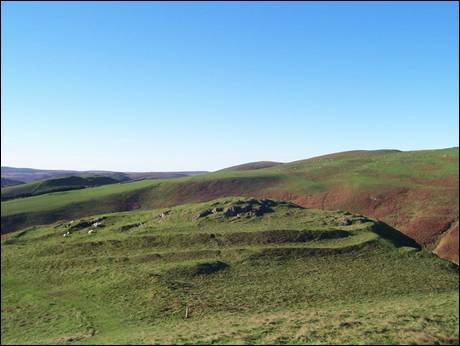 First mentioned in documentary sources in 1242, it is thought that the `deserted` medieval village of Clennell, one of the `Ten Towns of Coquetdale`, was cleared to make way for the park and gardens surrounding this Grade II Listed building. The hall occupies a strategic position at the entrance to the valley of the River Alwin and consists of a medieval tower house and an attached 17th century house with 18th and 19th century additions. It is now a hotel and the site of a riverside holiday park. Once over the River Alwin I followed a red, gravel track north-westwards and when the fine dry stone wall on my right came to an abrupt end, I turned right through a large and comparatively new gate. I then began to climb uphill on a good, green track and on coming face to face with a post and wire fence I turned left through another gate. As I continued upwards I remembered that on a previous visit to the area I had caught a brief glimpse of a red squirrel running towards the hillside-hugging plantation to my right. Unfortunately, on this occasion I was not so lucky and I pressed on to Camp Knowe. he slightly gnarled Camp Knowe is a spur of Clennell Hill and, despite its modest height, offers grandstand views of the River Alwin. It is also the site of a defensive Iron Age hillfort. I could have lingered endlessly but I was keen to keep the momentum going. So, after making a short descent north-eastwards, I headed up the south-western, grass-covered slope of Clennell Hill and to even better widescreen views of the wriggling River Alwin. From this crows-nest vantage point I was able to clearly see how much the September 2008 floods, which had caused devastation throughout parts of Northumberland, had remodeled the course of the river. The actual summit of Clennell Hill, which stands at a height of 1056 feet above sea level, now lay to the east and as I made my towards the unmarked top I soaked up the distant views towards Wether Cairn and the fringes of the vast Kidland Forest. Once over the summit I continued in the same general direction, aiming for the small gate slightly downhill and the adjacent public bridleway which would lead me to Rookland Sike. Once through the gate, the temptation was to continue straight up the moss-covered slopes of Silverton Hill from where I knew I would have first class views of the brooding Simonside Hills. But once again, I decided to stick to my original route plan and, turning left, I followed the clear path down to Rookland Sike. As I stepped across the tiny trickle of water, with bracken-covered slopes rising steeply on both sides, I felt totally cut off from the rest of the world. I took a deep breath, crossed the small step stile and began the short climb towards the ruined buildings of Old Rookland, uninhabited for more than half a century and now looking a sad and sorry sight in this lonely landscape. 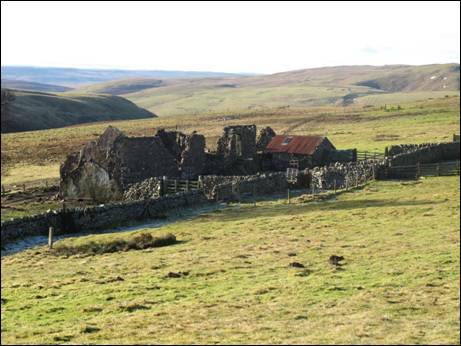 The derelict farm, with its three distinctive trees, was once the home of a certain John Dagg, who left here together with his family of 4 children in May 1939 for a life as a shepherd at the now whitewashed cottage of Dunsdale in the Lambden Valley. In December 1944, John, his dog Sheila and a fellow shepherd rescued 4 members of the crew of a bomb laden U.S. Army Air Force B17 Flying Fortress aircraft which had crashed into Braydon Crag, north west of The Cheviot summit. As a result of their actions both shepherds received the British Empire Medal and border collie Sheila received the Dickin Medal, the animal equivalent of the Victoria Cross. ow parallel with the ruins, it was time for me to make tracks to the highest point of my walk, so, after turning slightly to my left I headed towards Rookland Hill. There was no clear, direct path but the occasional quad track eased the way across mat grass-covered ground and before too long I was standing on the flat, 1148 feet high top enjoying excellent views across the surrounding hills. But the best was yet to come. I started to leave the high ground by turning sharply to my left and descending towards the south-west and the lower Alwin Valley. 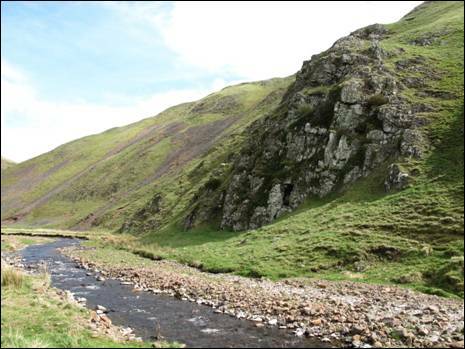 As the angle of the grass hillside began to sharpen I was presented with the most perfect picture of the River Alwin, stretching out below me, together with the near-vertical, scree-smeared slopes of Clennell Hill tumbling down to the valley floor. For this view alone, the effort of the walk was more than rewarded. I continued to admire the view as I carefully made my way down to the footpath alongside Rookland Sike from where I re-joined the red, gravel valley track I had left little more than an hour before. I was now on level ground and, turning to my left, I followed the track down the valley with the river as my companion. The river is one of the many tributaries of the River Coquet, which has been designated a Site of Special Scientific Interest (SSSI) under the Wildlife and Countryside Act 1981. 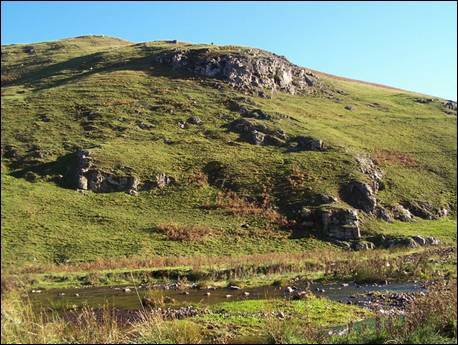 As well as being an extensive sea trout spawning ground, the River Alwin is also covered by the SSSI designation. I stayed with the river for the reminder of the walk, some 2 miles in total, and as I passed Clennell Hall the red track turned to a thin band of tree-lined tarmac which soon took me across the haugh beyond a small road bridge and an adjoining weir. A cattle grid marked the end of the valley road where I then turned right towards a very sleepy Alwinton. As I meandered merrily past the empty field where the Alwinton Border Shepherds Show is held each year on the second Saturday in October I could not help but think how lucky I had been to have had these beautiful hills to myself on this the most delightful of walks. This article first appeared in the April/May 2010 issue of `THE NORTHUMBRIAN` magazine.